There is a major difference between Conservative leaders and Conservative followers: the crimes are perpetrated by the leaders, the followers just "go along." And the Conservative sheeplets can't even be accused of "aiding and abetting" their criminal capos - they just support them and follow them blindly. In a list of "50 Signs You Are In The Tea Party Based On Real Events,"
none of the "signs" exhibited by the followers are really criminal activities. 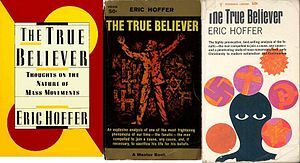 They are just the moronic responses of the True Believer, as noted by Eric Hoffer, as the knee-jerk reactions of the disaffected, powerless, underclass looking for a cause to give them meaning in life. "1. At a debate, you boo a soldier because he is gay. 3. You accuse Obama of being a Muslim, yet condemn him for going to Jeremiah Wright’s Christian church. 4. You admire Sarah Palin’s keen intellect. 45. You think it appropriate to arm yourself for political rallies and think armed militias are a great and noble idea. 46. You think that atheists, gays and minorities are not real Americans. 47. You think that Creationism is a valid theory to teach children in science classes. 48. You think that natural disasters are God’s wrath on humanity for homosexuality. 49. 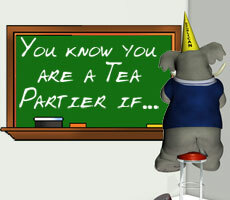 You think the Tea Party is a grassroots organization. CBS report: Healthcare law repeal efforts by House GOP cost nearly $50 million. When Conservatism is criminalized, the followers of the Conservative leadership will have to be treated differently; like drug dependency, the followers will have to be somehow rehabilitated, not punished. Confiscation of the leaderships' assets should be the appropriate source of the immense financial costs needed to rehabilitate and re-educate the poor True Believers of the Conservative caste. told a joke and heard a laugh upstairs."